Third wave feminism (to which I subscribe) really boils down to “more choices for more people.” On the whole, we’re not seeking the complete inversions of current gender roles because that doesn’t increase freedom. The right to equal pay, for example, is about equality. It is not a movement to make it so than men are paid 70% of what women are (despite what some people might think). Gendering the sport of tankery in this manner takes something from the province of men and boys and places it in the hands of girls and women–at least when compared to our social norms. The show plays on a subtle inversion of how we normally align gender roles. Since waging war is currently considered mainly the province of men, the idea of high school girls doing it implies an upending of the social order and therefore seems progressive. But it really isn’t. Placing any activity in the province of “girls only” or “boys only” is limiting, regardless of the activity. And tankery is no exception. Just because we don’t encourage our young girls to ride around in tanks doesn’t mean that the informational video shown by the student council isn’t a prime example of gender enforcing. I could cite the uniforms, or the fact that the world of GaruPan makes cheerful spectacle of a supposedly violent act, but I see no need. Most telling however, is that girls in the show consider the possibility of boys doing tankery to be absurd. This outlook indicates that the world of the show has merely changed the trappings of gender, not broken down the binary. Yes, yes. GaruPan is all in good fun and no, I’m not planning to take every show to task for failing to further the cause of feminism (it would take too much time to nail every show that comes out to the wall). Instead, I’m trying to get you all to think a little when you watch shows in alternate worlds and novel settings. It’s one thing for a show to have “gender A does this thing that normally gender B does!” and it’s another for the show to say “thing B is open to all genders”. Look for the latter. Not the former. P.S. It’s worth mentioning that 8dayswithoutme, the bro-est bro who ever bro-ed serves in the American military. Claiming to her face that soldiering is not for women will probably end poorly for you, but this show clearly operates under the idea that girls in tanks is an unusual enough juxtaposition as to be funny and clever. The funny thing about this was “:V” was also my first thought after reading this post. I think this might be barking up the wrong tree a little bit. Or it might be looking too much into how gender roles are set. You have just compared things to Strike Witches, and it would have been set as well to the same extent. That being said, what about Izusu Hana’s story in terms of what tankery is compared to flower arranging, given how vehement her mother was against the former. Doesn’t Girls und Panzer further this cause though, based on your definition? Yes, the show has gender A alone doing tankery, which normally only gender B does. But isn’t the whole point of this gender reversal to show how absurd and arbitrary any such gender assignment is in the first place? If the show had had both girls and boys doing tankery, it seems to me that it wouldn’t have made this point nearly as well. Ok, both genders are doing tankery, but so what… why is anyone doing tankery in the first place? I would never even have thought of traditional gender roles in regard to tankery. By making tankery out to be the most feminine of arts, the show makes you realize how absurd and limiting these categorizations are in the first place. I definitely wouldn’t call this reversal subtle, and I don’t see how anyone would interpret this as a progressive vision of gender roles. I think it’s important to distinguish between whether the show itself portrays feminism and whether the world the show portrays is a feminist utopia. 1. Whether the absurd depiction of arbitrary roles furthers the subversive goal of demonstrating the failings of the gender binary. 2. Whether the world depicted in the show is progressive in regard to gender. This post sought very narrowly to address #2, which is basically demonstrating that a society is not progressive in regard to gender so long as all you’re changing is which roles are assigned to which genders (take the Drow for example). True, this is basic stuff, but important to remember when looking at more complicated situations like Strike Witches or Gunslinger Girls. As to point #1, I think it’s probably too lenient to slap the label of “subversive” on something merely because it’s absurd. Since the show is in the Strike Witches vein, part of the absurdity operates for the amusement of the audience, that the lightheartedness of their approach to tankery conflicts our solemn views on war. The show WANTS you to chuckle at how the tableaux is silly, not at how silly our gender roles are. True, you can get there from here, but the show hasn’t really taken the time to focus on the social implications of tankery beyond high school and family, which undermines its subversive quality (Sora no Woto suffers a bit from this two, sadly). I think the key here is they presented the video as a totally outdated wartime video. That in my view is where the proof is. We look at those very videos and views as being outdated. For the most part, I don’t think the anime has any real intention of being subversive. Certainly not in regards to conflict. It doesn’t need to continue to focus on anything else about the social implications of tankery, because the world has already implied that it’s just another afterschool activity. But the crux of this conversation is that video, in which case the presentation totally matters. FWIW, it was the offhand comment about the absurdity of boys doing tankery that struck me more than the video. The video just made it explicit. Part of it is reading the expected reaction of the audience into the work. It’s reassuring to have a conversation where most people note that what’s absurd is the whole gender binary, NOT that girls drive tanks. What’s absurd is surely treating a dangerous wartime activity on the same level of, say, flower arrangement or varsity sports. I think any kind of gender idea is something the viewer optionally can bring in. I think the conceit in the Tankery PR included its gender-based assignment mainly as a way to justify its original concept of having school girls pilot tanks (like the rest of the PR video). Of course, I see we have not taken this beyond the face value this way, which is just as entertaining. It’s probably very difficult to discuss such a claim at this time, but can you explain how Strike Witches is more complicated than Girls und Panzer in this regard? To me the two are very much alike, 6 episodes or so in at any rate. I mentioned Strike Witches as more complicated because in addition to being fetishisized, the girls are also weaponized which is a complicated form of objectification? Gunslinger Girls basically takes this on and it’s also a subtheme in Mai-Otome. Great “power” doesn’t have to beget agency or control over your life. Those are themes so far absent from GaruPan. If I could like a comment, I’d like this one. “Great power doesn’t have to beget agency and control over your life”– perfect. Cool, that does clarify things. Actually, I don’t think there’s any reason to believe that that’s what the show is intending to say at all. The anime is clearly having fun by reversing the gender roles, but it doesn’t seem to say anything about whether or not it’s inherently absurd; merely that it’s absurd from the point of reference of modern society which posits that tank battles are primarily a masculine endeavor. Of course, it’s equally ridiculous to say that the show IS trying to say, “It’s silly that it’s silly!” It IS saying it, but that’s more from the way we read it than any clear intention from the creators. The show certainly deserves full credit for any progressive messages it might accidentally land on, but really, it’s in the same vein as Strike Witches, a show primarily about awesome depictions of cute girls doing badass things. Your second part of the post that talks about OUR reading is what’s important and explains why I spend so much time talking about feminism as a valid place from which to approach critique of anime. Being aware of these ideas empowers us to see both the good and the bad in each work. For me, I feel that learning how to see these things doesn’t have an end goal of giving shows a “pass” so that I can passively enjoy them. Instead, you hone your ability to see these things so that you can reflect on a show’s content and think about how it might affect your daily life. I never really read Garupan as much of a gender commentary in the first place, seeing it more as Strike Witches with a different tone to its fanservice (and with tanks instead of airplanes, obviously). The real progressive show this season is Ixion Saga DT, strangely. I saw what you tweeted re: the trans* episode & I shared it in our chat. That is surprising. guuuuuh. More homework in an already awesome season? I don’t think I’ll survive! True that. Especially how the issue was dealt with in that episode. I am so glad you watched this show! Here’s a thought for you: I was recently reading about Pulitzer Prizewinner Junot Diaz and his new book, a collection of stories about a chauvinist sexaholic. In a nutshell, many writers say that Diaz is a strong feminist, even though his narrator objectifies women as little more than T&A, because we come away from these tales feeling like there’s something unjust about the world. Such is the author’s skill. So, thinking about that… Couldn’t the same idea be applied in this case, to Garupan? Even though tank fighting has simply changed gender roles, and the underlying masculine/feminine constructions are no more fluid than before– Don’t *we* the audience, by watching this show, come to realize that girls can, in fact, do anything they want to, if only the world would let them? And isn’t that something wonderful to learn? Much like I said to Draggle, I think you are in part correct–that the show does offer an obvious opportunity for us to call out the absurdity of gender roles. However, BECAUSE that’s the case it’s important that someone does so. Making it clear to our community that we understand these things instead of letting them go unsaid is the core of being an ally. Which, given the dire need for this behavior in adjacent geek communities is a good habit to develop. Intention is difficult to draw a line in the sand over, I think. No, Garupan doesn’t *set out* to examine gender as such. It’s painfully obvious that this was brought into the world solely for the heady brew of cute girls and old-school militarism. I think Day’s the one who pointed out that this might make Garupan one of the most conservative-minded shows of all. But! The show is here, it exists, and we’re reading into it what we want to see. I would say that it even provides this kind of venue for debate is progressive. Not perfectly progressive, and not very third-wave (not very any wave, really), but it’s growth. That’s part of the point. :) That the group is discussing this eagerly is worth nothing loudly and in public. With an all-girl tank squadron, Garupan seems to portray it as simply another cute little outing for the girls involved. Tanks are merely so much decoration here; the odd paint jobs show that they care for the tanks as they would personal diaries or somesuch. I think that’s what I get from this. More of a “tee hee girls are silly no matter what they do!” This the emphasis on grace, beauty, etc. Kind of a backhanded compliment if you will that girl will “corrupt” masculine things making them cute, thus boys don’t want to get involved with the hobby/sport. I actually found the girls using drawings and other cutesy stuff on war gear a refreshing, nice detail – one of those things you’d do as a sort of ritual, to relieve yourself from psychological pressure by making use of something familiar and reassuring. 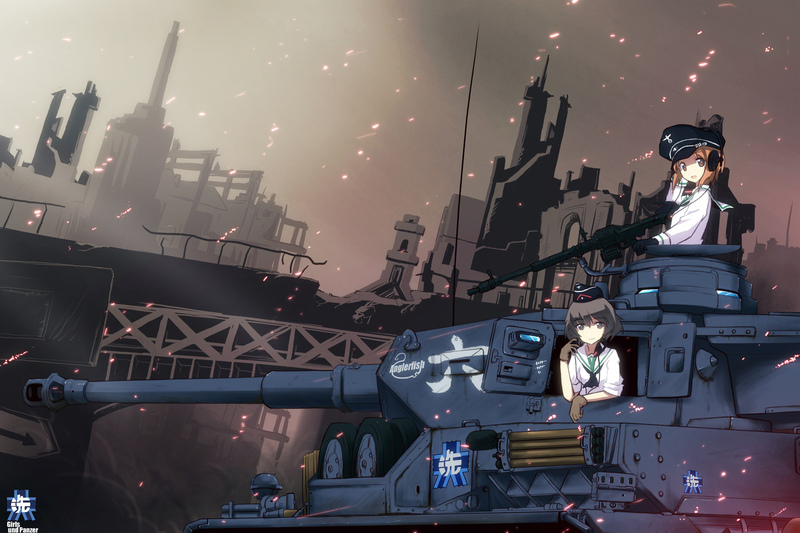 I think the anime does not try too hard to pass any kind of message, but it’s certainly having fun with both the relativity of gender roles – by showing us a world totally absurd by our standards but which in a preposterous way manages to make sense of the idea that tanks can give girls ‘girly’ qualities – and the way in which a traditionally male activity is personalized by the presence of girls. The show is a theatre of the absurd in many other ways – what with all the collateral damage and the deadly risks involved with a school activity? – but though I wouldn’t say it’s explicitly “progressive”, it’s not supporting strict gender roles either. I got from it a vibe similar to the one I got from the first season of My Little Pony: Friendship is Magic – a show not supporting the idea that women should turn into bad copies of men in order to appear strong and dependable, but that they can be as feminine as they want (ranging from Yukari, or Rainbow Dash, to Saori, or Rarity) and still be strong and dependable. They say it even explicitly about Hana at one point – that she’s of gentle appearance and yet extremely reliable. And I found excellent also the moment in which Saori has to give an announcement, everyone thinks she’s going to talk about boys again, and instead, for once, she says that she’s gotten a Radio Amateur Operator license – and telling her friends about her accomplishment she sounds more satisfied than she ever did with all the talk of love in the rest of the series. I think the more elegant thing that Garupan does with the video is that it’s presented as a more or less a video of propaganda, designed to stir up interest with appeals to tradition, normality, etc. Or more importantly, by positing it’s reversal, it forces the viewer to question the restriction’s existence at all, which wouldn’t happen (as much) if it were a show about guys participating in tank clubs. So, it’d be hard to say Garupan reaches any sort of Feminist ideals in form, but that isn’t to say it isn’t positing a Feminist question, especially with the exclusion of men from the warfare sport being an ongoing mystery. You could say the show never intended to draw attention to the issue, but I think lines aggressively spelling out the diegetic absurdity of men in war is essentially proof of intent. A great post! I too agree that Girls Und Panzer focuses more on genderswapping than actually breaking down the lines that defined gender, the ones that society has enforced. However, I do slightly disagree that the show doesn’t have feminist tones or doesn’t further the causes of feminism in anime media. Whereas it does fail in understanding that sexuality and gender are fluid, I think it does serve a point in approaching the stereotypical ‘strong female characters’ idea and subverting that element to an extent. I think a common misconception in feminist theory (or at least, basic theory) is that in order for a girl to be ‘strong’, she has to be empowered or ‘badass’; that she has to enter society’s constructs of what it means to be masculine and let those constructs swallow her gender. We could talk about Katniss Everdeen from The Hunger Games, who uses archery and strong-headed determination and wits to exemplify her ‘badassery’ or Arya from Game of Thrones, who mercilessly kills her foes without any regret. These are the most popular stereotypes of women in media. But this stereotype only skews the problem,as there really are no right or wrong ways to be a girl – once again, these are boundaries drawn by society’s ideas of gender, so the labeling of ‘strong female characters’ is rather problematic in that it demonstrates that you’re only conforming to those constructs, rather than trying to break them down. That in order to be accepted as a likable female protagonist, one has to be ‘masculinized’. To my understanding, Girls Und Panzer to an extent does realize this, because our female character are equipped with ‘badass weapons’ – tanks – and fight with other people in them. In this sense, they embrace what we would define as ‘masculine’ traits – fighting others with destructive weapons, but they also exhibit ‘feminine’ traits as the audience would understand it, by not being continually serious, aggressive, or ferocious – traits that come with being a ‘strong female character’ and are considered to be ‘masculine’ in nature. They feel comfortable with the sort of people they are. Thus, our female character’s aren’t really models of the ‘strong female characters’ archetype, but they ARE well written female characters who possess an agenda and the ability of choice, and end up winning through hard work and effort. They choose to participate in this hobby because they like it! And why not? What’s wrong with doing this for fun? It’s refreshing to see girls participate in a sport not to save the world, or for any overdramatic or trivialized reason, but just because they wantto. They CHOOSE to do it. And that, I think, is what makes Girls Und Panzer have some feminist tones. I still agree however, that the show only slightly bends binary roles in this aspect – as far as the whole idea of ‘males piloting tanks is ridiculous, this is only for girls’, Girls Und Panzer fails to break down these lines. It doesn’t enforce breaking down gender roles. But it does take a spin on what it means to be a ‘strong female protagonist’, and I do think that’s worth something! It’s a mixed bag. The idea of “masculinizing” women is pretty pervasive. It speaks of the difficulty of women breaking into a world originally dominated by men. When you think of people such as Cleopatra or Joan of Arc, we see women who lead armies and nations, but prescribed notions of femininity remained intact. People already mentioned the propaganda film, but I’ll add my two cents. That film presents tankery as a means of bonding with teammates, as tanks are enclosed spaces with three- to four-person crews piloting them. With Garupan, at least we see the female protagonists engaged in a nominal role reversal – no men participate. As illegenes mentioned, stereotypes of the “strong female lead” (at least in the West) portrays women and girls as independent and aggressive. They took the effort to assert themselves on “masculine” terms. With Garupan, we don’t see that overt display of role reversal – the girls see tankery as an extracurricular activity, one that doesn’t engender acting “male” to prove their worth. I have two choices here which means I’ll offer you two responses. First, I can “piss in your Cheerios (cheerio! )” by claiming that “strong, female leads” don’t offer the type of vulnerability that lends characters to moe affection. Since moe culture demands that these girls be “girlfriend material”, overwhelming independence and steely resolve would be negative traits (remember men read too much confidence as “cold” and your prospective ani-girlfriend can’t be COLD to you). What you’re seeing, then, isn’t NECESSARILY an evolution towards balanced main characters but could also be an expression of the moe database at work (look for discussion of this when I get around to watching Stay/Night in an impressive display of masochism). Only continued watching will tell! ON THE OTHER HAND, you can spin the show any way you want when you talk to people about it. Bringing up the unlikely mettle of the Oarai girls serves as just a good example to your daughter as does Alita/Gally and her tomboyish violence, so to some extent our ability to interpret and get what we want out of a work allows us to enjoy something regardless of authorial intent (it’s also the same logic that doesn’t protect the author from giving offense when he doesn’t intend to… if that makes any sense). It shows how sad the the anime industry is when it has completely nullified your (well, my) ability to care that much about the issues you bring up with Garupan (in regards to the actual show, not the issues themselves) due to the fact that there’s a ubiquitous amount of anime out there that tries and fails at the feminism thing to the point that you just run with it when it occurs. Nowadays, you have to be as blatant as Bakuman in order to bring up the energy to care about sexism and the like. Well it didn’t help that so many anime this season brought “that” issue up as well. Shin Sekai Yori, Btooom, Psycho-Pass, and even Magi and SAO went into that territory. Uhh…while basically everything that I think I could add has probably been said, I do think that Garupan does a good job of walking that line between “girls shouldn’t be stereotypically girly” and “girls shouldn’t be forced to be masculine”, which can be rather treacherous. I think it does a good job of having a wide variety of personalities and interests among its cast. The Anglerfish team alone covers a wide swath, from Hana one one end to Yukari on the other. Not to mention the Historical reenactors in the Hippo team (also I’m amused by how after so many Sengoku and Sangoku genderswap shoes, the idea of a girl named “Erwin Rommel” doesn’t phase me at all), the cute first years, the athletic volleyball team…there’s just such a huge variety of people involved. Garupan probably didn’t set out to be “feminist”, but I think it basically ended up that way, simply by being well written and respectful of the characters. And isn’t that the ultimate goal, to not have to work for things to be feminist, for it to be the default. Its not entirely there, but it gets pretty close. I think there is a difference between whether something is overly feminist in its intent and whether something has a feminist READING. For me, GaruPan has too many trappings of regular moe titles and not enough subversion to fall into the category of ‘feminist anime’ but clearly has some surprisingly redeeming qualities for a pander-esque show about girls riding around in tanks. Not that your points about the main characters don’t have their merits (as do Natasha’s points about the quality of the anglerfish team girls as main characters), but the obvious database-y nature of the the side characters makes it hard for me to claim that this show doesn’t peg moe fan guys as its primary audience. Well I don’t think there is any particular doubt about who the main audience is, but speaking as a male moe fan, I do definitely appreciate a show that respects its characters, as Garupan clearly does. It makes me think of the play A Doll’s House, by Henrik Ibsen. Ibsen himself likely didn’t intend to have Nora represent a feminist ideal, but discourse at the time quickly grasped the importance of a character like her. Nora’s wish for self-discovery leads the narrative, and she realizes that Torvald doesn’t offer her that sense of enlightenment. Of course, the play also deals with the social complexities of marriage, and Nora’s decision to leave Torvald thus became an act of defiance. I have to be honest here I don’t think that this show was meant to have a feminist reading and I think i read somewhere the author was a tank nut who wanted to do a show about tanks but for it to sell he had to add in moe. Suffice to say the show seems to push tanks more on the viewer than moe girls doing cute things. At least from what I have seen. That or the author took a page from the Israeli tank forces and came to the same conclusion that men pay more attention to dry stuff when the topic is being presented by a woman. Tankery, or Panzerfahren (I like the term better) is rather removed from war, it’s rather like how paintball and airsoft are to urban warfare. There are some aspects that are similar but fundamentally it’s a sport with defined rules and officiating. Pure tank on tank engagements were generally rare as armored formations worked in conjunction with air support and mechanized infantry and as such I am inclined to invoke “C’est magnifique, mais ce n’est pas la guerre.” (It is magnificent, but it is not war.) More over the goal is not to create a new generation of Tank Aces that will be sent into some meat grinder. Thus while you can try to flip the gender binary, with regards to war it’s mostly a mirage. That said Garupan has done it’s homework and it is fairly accurate with regards to the tanks themselves even if the action takes a few liberties for the sake of dramatics. I agree. True feminism is really just “humanism” I guess. Women’s rights are human rights, as our own Hillary Clinton once said. I’m not a fan of hers, but she was right about that. Still, this show looks silly enough that it doesn’t seem like a big deal. Also, I get really irritated when I see that title mixing English and German like that. Shouldn’t it be “Mädchen und Panzer”? Just stick to Japanese, guys. As a guy with ongoing interests in gender equality, I find this “third wave feminism” concept interesting. I think its got the right idea, but fear that this may get lost in what people define as what is “choice” and what is not. Put it this way: say society imposed a law that said all women must stay at home and be a housewife, and that any woman who contravenes this by getting a job will get heavily taxed. This will definitely make it difficult for women to get jobs, but people argue that this doesn’t *prevent* them from doing so, the mentality being that those who really want jobs will do so anyways. I get where they’re coming from in that people are indeed resourceful creatures and are able to find ways of getting what they want at minimal compromise elsewhere, but I guess it misses the point that the law shouldn’t mean women have to make these compromises any more or less than men should have to. What are your thoughts?? With regards to the problem of the gender binary in anime: I think it’s not so much representative of the chauvinistic attitude of the producers; rather I think that’s the way ALL aspects of the industry operate. Anime, and indeed Hollywood, seems to be built on established stereotypes and the kinds of ways these can best be portrayed to get a reaction from the audience (see: TVTropes). Postmodernist Japanese Philosopher Hiroki Azuma even talked about how the otaku industry is now nothing more than a database of these collective traits, and shows nowadays simply vehicles of showcasing these in ways that otaku want and like! The “progressive gender-equal society” (as it should be, at least) hasn’t yet entered this database, and I unfortunately doubt it will any time soon. Indeed, I often find myself dismayed at how often Azuma’s database theory is true, and occasionally wonder if this has left creators complacent with this existing database and unwilling to innovate to create a new trope! In regard to your second comment, I think that a lot of the stagnation in any medium is about fear. Not necessarily fear of women, but fear of taking a risk and losing a lot of money. Anime seems especially prone to disaster because the outlay is so large and so far in advance. In these situations “doing what works” seems so much more desirable. This is why I am really optimistic about KickHeart. The idea that we can crowd fund riskier projects AND give voice to American consumers is really exciting. But on to your first point. Yes, the goal is to give everyone as many options as possible which means that we should strive to make sure the law does not stand in the way of what anyone wants to do. It goes even farther than your explicit example into things like mandating maternity OR paternity leave, or ensuring that birth control is covered under health insurance. The reason WHY the movement is called feminism even though it pursues equality between the sexes is because so long as we question why women would want to enjoy the same freedoms as men. Or so long as we consider the feminine lesser. The purpose of this post isn’t to talk about how Tankery is the be-all and end-all of oppression, but more to focus on how the gender binary itself serves as an oppressive force regardless of its trappings. Fear of losing money, huh? I agree that is indeed the problem, but am no less dismayed. A shame producers aren’t able to undertake artistic explorations without having to worry about practicalities like this! That said, this is the first I’ve heard of KickHeart and it does sound promising. I’m very pleased those devs sought to take active steps to get non-Japanese input and I’m pleased they’re succeeding! Story-wise, yeah I’m sure dominant woman has feminist written all over it, but stereotypes mean little in the way of overarching moral principles. Saber from Fate/Stay Night may have been a respected monarch with an iron will and so seem like a feminist icon, but the way she ended up acting in the bedroom in the VN did her no favours IMO! The fact that she remains recognised as a role model for girls in Japan despite this has me really worried…..Eh well, I’ll hold my breath and hope others come up with better portrayals in future. RE feminism being called feminism: oh, I’m completely with you. All minority groups need a voice and I’m happy that women discontent with the status quo took the initiative to make one for themselves. I know there are people who nitpick and say, oh what about the guys who get beaten up by their wives every day? But honestly, there are domestic violence support groups too and they aren’t gender-prejudiced (in my experience anyway), so yeah…. Even third wave Feminists still don’t understand irony.